Adam Hedengren chatted with El Morabba3, the new Jordanian rock band that makes Arabic music on its own terms. El Morabba3 is a family business; Tareq and Mohammed are vocalists and songwriters but also cousins and had worked together on various projects when they decided to set up a band that would allow them to create new sounds. They teamed up with Dirar and Odai, two brothers who enjoy playing “non-traditional grooves”. 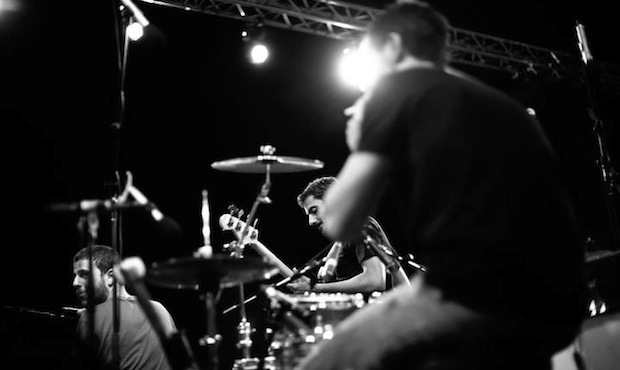 Lyrics are in Arabic, but the sound of this emerging rock band from Jordan is anything but traditional. “We did not want to sound like a western rock band that only sings in Arabic, neither did we want to sound like a western style mixing Arabic instruments,” the band tells Your Middle East. They all feel strongly about the musical heritage of their region and say that there is no reason to mess with that. Rather, it is the alternative music space that is in need of a fresh breeze. El Morabba3 tries to encourage fellow Arab artists who play alternative, fusion or just typical western music to do less covers and more original tunes. This way, “we can hear more of what Arabs sound like,” they said. Singing in Arabic is also important, if just for the simple reason that people can relate more. This allows the capital to play a pivotal role for all new Arabic styles – not just in Jordan. Also, there isn’t much commercial music coming out of the country so alternative sounds have a greater chance of reaching a wider audience here. Inspiration, on the other hand, can come from anywhere in the Middle East. When it comes to how local customs impact creative freedom, they agree that censorship is always in place, but that is not unique for Jordan. But then again, it is how people act and see things that inspire the band to make music. They want to be honest about reality, which is why in a song about love the listeners may find revolutionary messages hidden in between vocals and rhythmic drumbeats. Although El Morabba3 has a strong footing in the local environment – their second album will be “even more Arabic as far as the choice of musical scales and vocal lines goes” – they are heading towards a more electronic sound. One of their favourite Arab artists is Cheb Khaled, king of raï and master of the synthesizer. The band is still new – their most popular song on YouTube had 25,800 views at the time of writing – so it is too early to tell if their sound is new and appealing enough to reach a very large audience. But one thing is clear; they talk about music in the way one would like music to be spoken of, as if it’s both a science and a calling. A combination of pinpointing, almost logically, how to interact with the instruments while at the same time finding chords on pure feeling and emotion. “We like to think that the vocal lines and the quarter note coming out of an electric guitar should be interesting to a western audience and that the way the drums and baselines are put under these Arabic vocal lines and lyrics should be interesting to an Arab audience,” they say. Ultimately, however, it all comes down to the basics. El Morabba3’s latest album is available on cdbaby. Adam Hedengren is co-founder and managing editor of Your Middle East. You can reach him at adam@yourmiddleeast.com.